These Class 1 PFA insulated thermocouple wire sensors are hermetically seal-welded at the sensor tip to provide continuous PFA protection over the measurement junction. 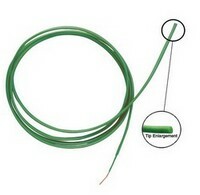 This unique design provides a small, flexible, and electrically isolated thermocouple, suited to a variety of applications. They have stripped bare tails (no plug).